Crochet Uncut > Columns > Crochet Questions & Answers > How do I keep yarn from twisting? A: This is a great question, and one that many, many crocheters either have grappled with, or will at some point. To give a full and useful answer, we’ll have to look for a moment at the structure of yarns. All yarn has some twist inherent in the fact that it has been spun. Untwisted yarn is called “roving” – and while it’s really soft and fluffy, it doesn’t work well for most crochet (or knit) projects, and it pulls apart easily. Spinning (twisting the fibers together) is what gives strength, stretch and texture to the yarn. Many yarns are actually twisted more than once when they are “plied.” Plying is the process of twisting two previously spun yarns together. Why? To give additional texture, blend colors or fibers, create a stronger yarn… there are lots of reasons. Most of the commonly used yarns are plied. The number of plies is listed on many ball bands and in the Ravelry yarn descriptions. Some yarns are listed as “single ply”, meaning that there is only one twist in the yarn; if you twist it between thumb and forefinger in the opposite direction, you’ll get back to single fibers very quickly. Quite often, it is single-plied yarns that have the strongest tendency to twist up as they are crocheted. This is true because, contrary to what you might think, plying twists the spun yarn in the opposite direction to its original spinning and can “neutralize” the tendency to twist up in use caused by the first spin. There are two other factors in the creation of the yarn itself that can lead to a twisting problem. The first is the tightness of the original spinning and the second is the direction of that original spinning. Single ply yarn that is very tightly spun has an advantage in that it is VERY unlikely to split while being used. But the disadvantage is that it has a tendency to “back spin” or twist up on itself as it comes out of the skein or ball, in response to the motions of being crocheted. This can be annoying to the crocheter, but we will discuss some strategies to reduce or eliminate back spinning. To understand the direction of a yarn’s spin, it helps to look closely at the yarn. You will see that the fibers all slant in one direction or the other. It helps to think of the slant as resembling either the center of the letter S () or the letter Z (/) In the picture below, the three yarns at the left are all single ply yarns, with their final twist in the Z direction. 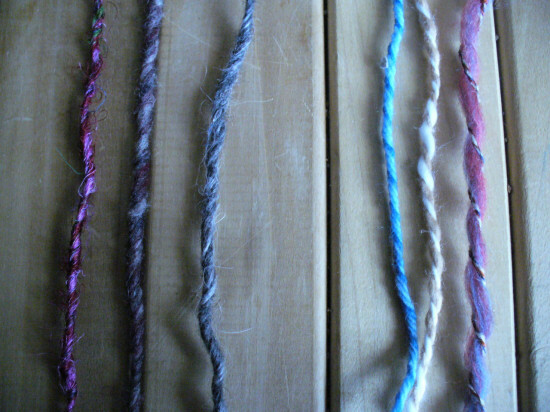 The yarns pictured on the right are all multiple-ply yarns, with their final twist in the S direction. Because most spinners (and commercial spinning machines) are right handed, most yarn has its original spin in the Z direction. Plying will reverse that, and most common plied yarns have final spin lines going in the S direction. If you look closely at the yarns that give you the most trouble with “twisting up”, you may find that one direction of spin or the other gives you more difficulty. This may affect your choice of yarns for various projects. When checking yarns for their spin direction, it is important to look at the direction of the final product, at the whole yarn, rather than the direction of spin inside each ply. The final two factors that can cause yarn to twist up during use are related to the way the finished yarn is treated, both in skeining/balling for use and in our actual crocheting. Both of these processes involve twisting the yarn again! Now that we know some of the causes of twisty yarn, how can we prevent it, or keep our sanity when it’s happening in the middle of a project? Try using the yarn from the opposite end of the ball or skein. If you normally pull from the center, try using the outside end instead, or vice versa. In this way, you can often cancel out the effects of any twist put into the yarn in that final stage of skeining or balling. Re-skein or re-wind the ball. This is easier if you have a swift and ball winder. Even if you must do it by hand, sometimes it can make the difference between pleasure and success in a project, or giving up on a beautiful yarn in frustration. Rewinding is another way to cancel the effect of the final twist that has been put into a yarn. Adjust the way you hold your hook. For some crocheters, switching from pencil-hold to knife-hold, or vice versa, can reduce the amount of twisting involved in each stitch you make. This is an easier solution for some people than others, depending on the nimbleness and versatility of your individual coordination. If you CAN do it, it may be the simplest solution. If you aren’t able to change holds, you can still make an effort to crochet just slightly more loosely than usual, which may relieve some of the twists caused by the stitching process. Adjust the way you manage tension with your “yarn hand.” When I am working with a very twisty yarn, such as recycled sari silk, I find that merely keeping the working yarn on a “shorter leash” as it comes out of the ball can reduce the twistiness. To do this, I ignore the fact that it’s twisting as it comes off the ball– but as it passes through my tensioning fingers, I use them to gently stretch the twisted part until it is straight enough to use in the stitch. If pulled slowly and steadily, most twists will untwist themselves with a little tension, and not turn into knots. Knots tend to result from pulling the twists tightly and too fast. This process slows down the pace of my crochet, but keeps me crocheting instead of winding balls and is the solution I personally choose most often. As a last resort, choose different yarn. Learn from close observation whether you personally work best with plied or single-ply yarns and whether you find less twisting troubles in YOUR stitching with the S or the Z direction in yarns. If you’ve chosen a pattern with challenging stitches, you can consciously choose a yarn that’s easy for you to work with. If you’ve chosen a yarn that you know will present you with tangly-looking twists and require concentration on your hold and tension, then perhaps you can use it with a more simply structured project.